The drive north was mostly unremarkable, though enjoyable. In Santa Ana, Sonora, we saw our import agent, who still has several pallets of our things he hasn’t shipped yet. We reminded him that the weather has changed, and if he doesn’t ship the few remaining guitars ASAP, they will arrive in the form of firewood. He was amiable as usual, if often difficult to contact, and took us to breakfast one morning – machaca and eggs at Elba Restaurant, a very “northern” style place, rather like Denny’s or Howard Johnson’s. The prices were higher than at regular Mexican restaurants, but the servings were simple, excellent, enormous. 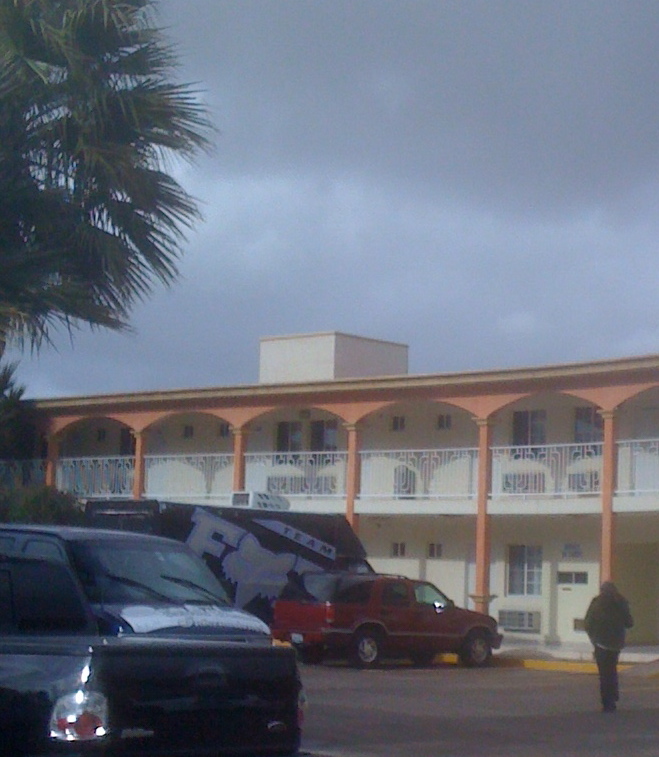 That night we stayed in one of “those” motels that rents by the hour, Aqua Inn Motel, and it was wonderful. 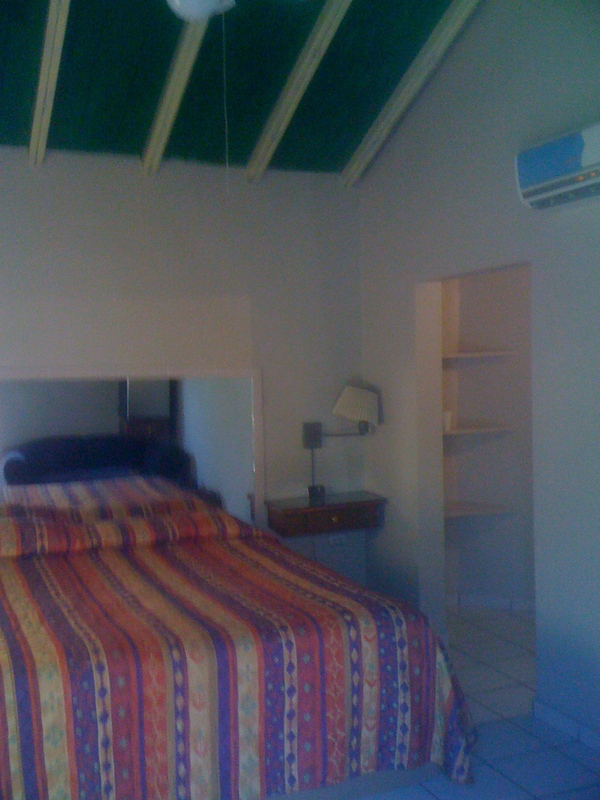 The individual garages (one reason we like that kind of motel) are directly under each room. 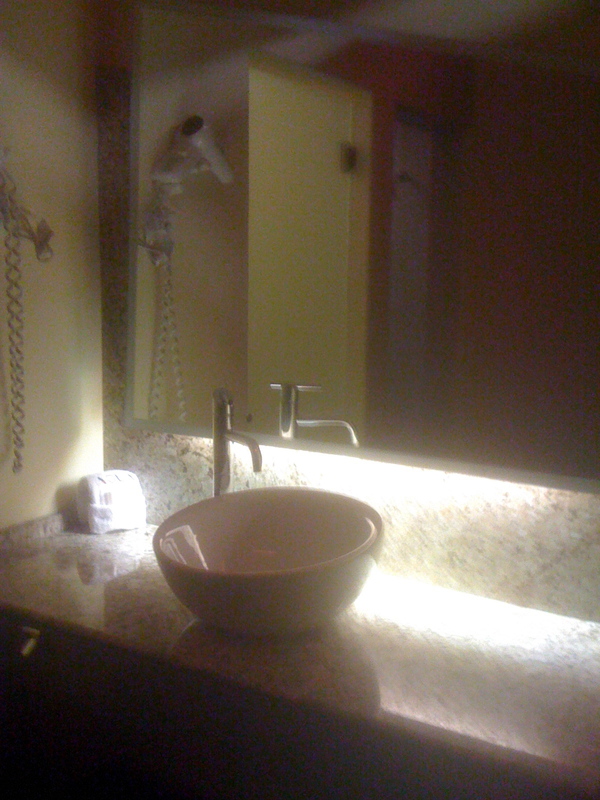 The room was large, with an enormous bed, a pretty sink, and a wonderful shower. The lighting was interesting – there was not a lamp or lightbulb visible. The light came from artfully designed slashes in the ceiling. We had been having mysterious problems with our PT Cruiser, involving, we thought, the battery,and in the morning it wouldn’t start. After an extended conversation with a friendly maid and handy-man, a pick-up truck arrived and got us jump-started. We knew we needed to keep the car running, and we decided to cross the border at nearby Otay crossing. We followed directions from two helpful (?) men, and found ourselves – don’t EVER, EVER DO THIS – in a Linea Sentri, where a special card is required. It is designed for locals who cross the border often. We were detained there for two hours by vaguely pleasant USA border agents. There is a possible $5,000 fine for frequent violators. They gave us a warning and sent us along. We drove straight to a AAA and got the registration, insurance, and a two-day permit for the smog check. That night, in Santa Clarita, we got a new battery, and (so far, at least), that has put an end to the strange warning lights and other inexplicable problems. In Lake Elizabeth, we saw our agent and did some minor repairs to the house. We were quite industrious each day, occupying ourselves with that and doctor/dentist appointments. Our agent was waiting for the ground to dry a bit for our septic test, the last hurdle in our escrow. We were quite confident about it, as our tank had been checked and OK’ed a few years back, and had always drained better than any of our neighbors’ tanks. 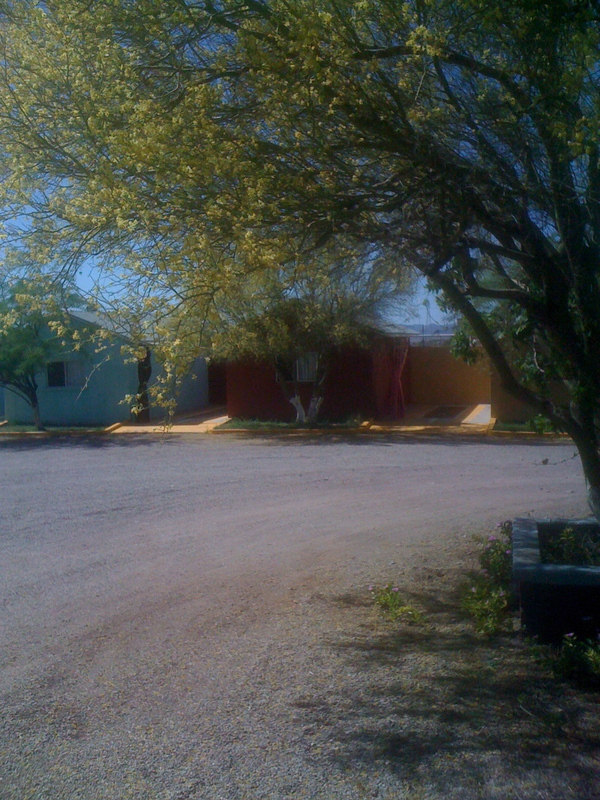 We signed the papers and left, then received a call as we were entering Arizona. The septic tank was completely, utterly ruined and crumbling, and there was no remedy but to get a new one, and have our leach lines extended. Five days later we have not gotten an update, and we are still hoping that our buyer has not changed his mind. The trip back to Mexico was just as fast and pleasant. There was a very pleasant meal in Santa Ana, as we were waiting to meet with our agent. We stopped at a place called Carne Asada With Chano. It was Easter week, and many places were closed, and the ones that were open were not serving meat. But at Chano’s, that’s all they serve. You order carne asada for one, or for two. 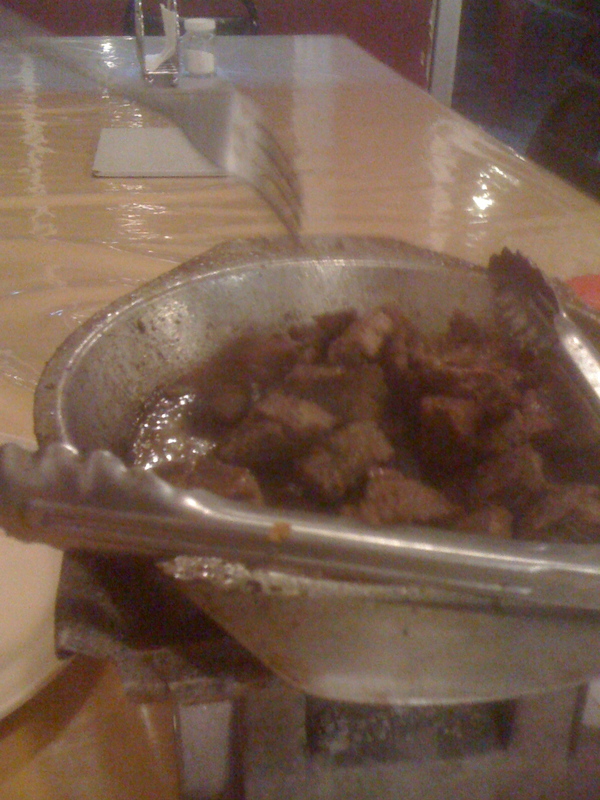 It comes to your table on cunning little asaderos with charcoal in them, three huge (really! almost as big as a – well, a pancho!) flour tortillas, and lettuce, onions, and salsa. It was excellent! adequate . It cost about $28 for the night. 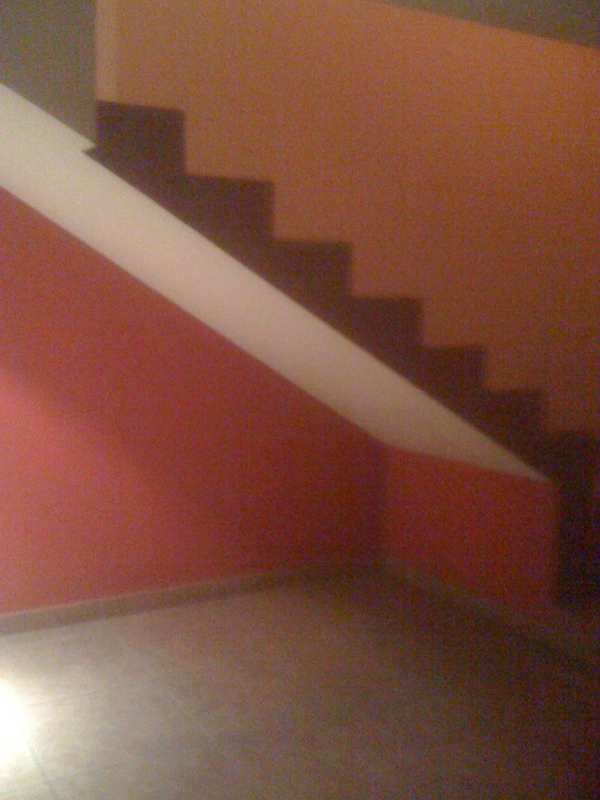 The Apolo, in Santa Ana. A little funky, but kind of cute! Like tiny little houses. Sonora is known for its good meats, and flour tortillas. And coyotas, the two-layered tortillas with good things between the layers. Check out the online site Coyotas Malu if you like. That’s where we bought coyotas for the trip north, and the trip back to our house. In the small shop in Santa Ana, they have literally hundreds of bags of coyotas of all flavors. There was also, I noticed, a small selection of home-canned goods – salsa, apricots, peppers. One thing I had hoped to accomplish in California was to get an “apostille” birth certificate, a sort of doubly-guaranteed birth certificate, necessary in Mexico for legal doings. That was not to occur, and it was just as frustrating as the many trips sometimes needed to accomplish things here in Mexico. We went in person to the correct place in Los Angeles – one of the “area” spots to get this done. My birth certificate was too many years ago for them to be able to certify it, and they sent us to a county building in Norwalk. There I learned that the Norwalk office only has information on birth certificates from Los Angeles County. It seems that the first guy should have noticed or informed me (wouldn’t ya think?) Anyway, I got a notarized statement from my realtor saying I was really me, and sent a request for the first step of the process to Stanislaus County, where I was born. This morning I received a call from the county recorder there, saying that my check was written for two dollars less than the fee. But they helpfully changed the amount for me so I didn’t have to start over. Thank you, Stanislaus County! We were very happy to arrive back at our house, and have been taking afternoon siestas to catch up on our rest. A couple of days of driving were at least twelve hours each. 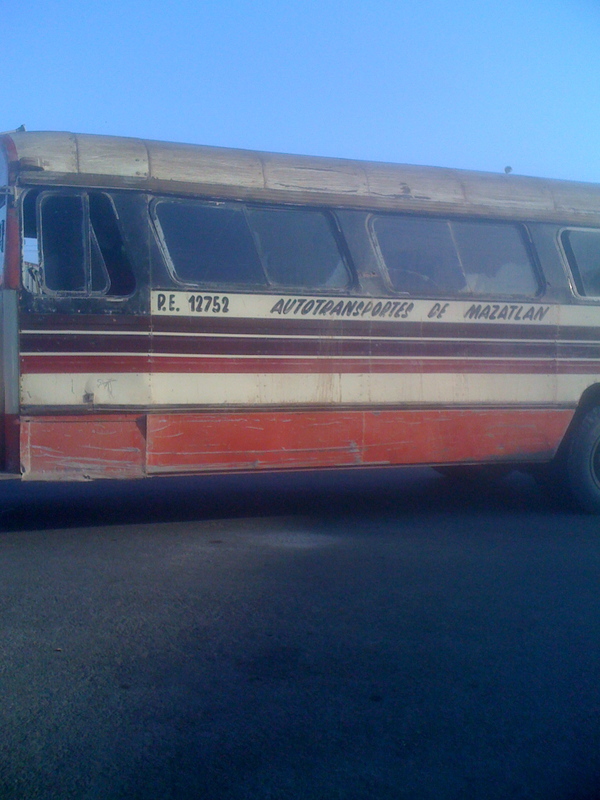 I liked this local bus from Mazatlan, in the state of Sinaloa, The Tomato State. A note: you can take your car on a ferry from Baja, California to Mazatlan! We are still catching up on the family happenings while we were gone – it was a two-week trip. More later. I am nearly finished with an entry about Music On The Radio In Mexico. This entry was posted in Uncategorized on April 27, 2011 by gubabbaboy.